Walk along Haight Street, between Clayton and Belvedere, and you will pass an alcove with a staircase that leads to a narrow doorway. The alcove hangs back from the sidewalk, partially obscured by a metal gate, and you might not notice it's there. But, if you're lucky, you will pause and peer into the shade, and your ears will reverberate with the jolly, irresistible sounds of an accordion. Ilya has a gentle face. It is framed by a black hat, glasses, and puffy strands of curly hair. He sits on the steps and holds an accordion against his chest, coaxing from it a jaunty tune that makes you wonder why the whole street isn't dancing, laughing, and clasping hands. 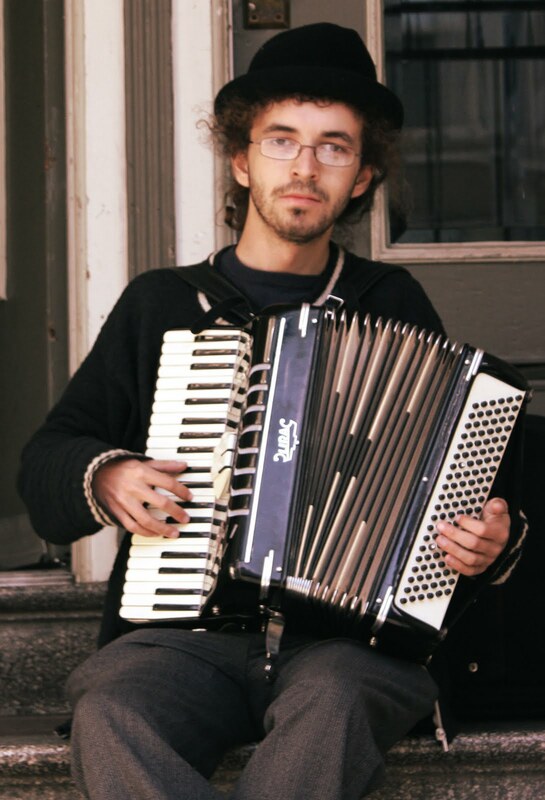 He was born in Russia and he plays the accordion because he grew up with the sound of accordion music, and because he once saw an accordion (not this one, he says) in a shop on the East Coast and decided that he had to have it. "I used to play piano, and then I stopped. It had been a long time since I played music, and then three years ago, I went to a music store with a friend and saw an accordion. I fell in love with it." He used to work in computers, but right now he mainly does this. He is putting together two bands, both grown out of his love for Eastern European music. One will combine Russian vocals with strings and accordion, the other will be a fast-paced brass band that plays Balkan and klezmer music. 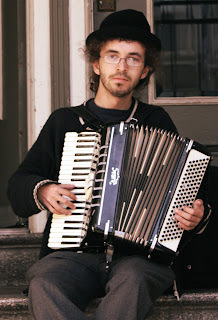 He plays his accordion on the street and in train stations. "I really like it when people start dancing," he says. "That's probably the most interesting reaction I get. They dance in all kinds of ways, and I think -- huh!-- I didn't think people danced this way to this kind of music, but it's kind of cool. I definitely enjoy that, when people are dancing." Haight Street between Clayton and Belvedere. At the BART stations, either 16th & Mission or Montgomery.